a lengthy series of steps. We have three computers doing processing, book scanning and sheet scanning. The most advanced computer is the site design and scan processing unit using an Asus ROG Rampage VI Omega Motherboard with an i9 7980 CPU, 128 gb of G.Skill DDR4 3600 memory, an Asus Nvidia 1070 video Card, Asus Ryuken 360mm water cooling, Asus 1200 Platinum power supply, an Intel DC-P4600 3.8tb boot drive, a 7.8 tb RAID array of 4 x 2 tb Intel m.2 ssds 2 x Samsung 960 2 tb m.2 drives and 5 x Barracuda 10 tb internal backup drives and a pair of 30tb Synology NAS. This entire system is overclocked by 73% to produce more usable PDFs each day than with standard speeds. Monitors are Dell UP 3017 IPS displays running in 2560 x 1600 mode. Library scanner computer and the sheet feed scanner commuter are both using Asus motherboards with i7 6900 CPUs and 64 gb of DDR4 memory using Samsung SATA SSD primary drives and 6tb data storage drives. We use customized WASD Mechanical keyboards and Corsair M65 mouses on all units. A pair of Synology NAS units, each with 5 x 8tb WD drives, maintain backups of the original scans and all site material. Additional hard drive backups are maintained offline in separate secure locations. Clicking on most items will bring up that product's description page. The first step in putting a document on the site is scanning. Depending on the publication, a sheet fed scanner may be employed,. For non-destructive scanning the camera based library scanner or a large format flatbed can be used. When we scan documents that do not have to be returned "intact" to their owner, the preferred method employs a sheet-feed high resolution scanner. We use the Kodak-Alaris i3250 which can do a 1000 page document in less than 15 minutes. The resultant scans are the best of all the possible alternatives. 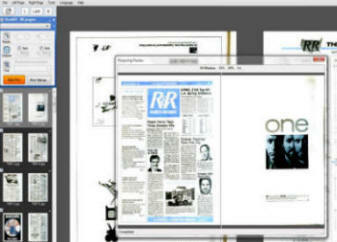 The downside is that publications have to be separated into single pages. The scanner is "duplex" meaning it takes a picture of both sides of a document in a single pass: it accommodates pages up to 12" by 18". We have two of these to insure no scanning down time. .
Click on the pictures of the scanner for a full description in a PDF brochure.. The i3250 is attached to a Kodak-Alaris A3 flatbed which runs automatically when no document is on the sheet feeder. 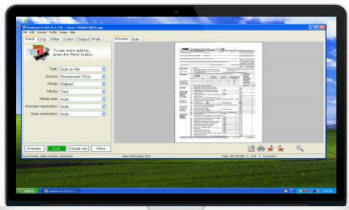 This allows for mixed sheet fed documents and fragile pages or thin items to be scanned with the same settings. The Kodak-Alarus scanner features considerable flexibility in document handling and scanning. 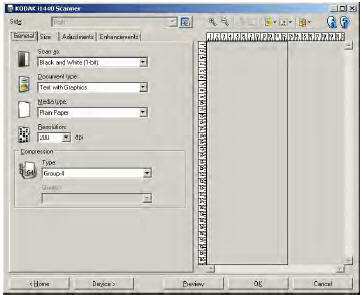 here is a view of one of the setup menus that allows customization by document type, size and resolution. Adjustments to contrast, brightness and document type can be made. The scanner is "smart" and reads graphics differently from text to get crisp letters and sharper pictures. It also does hole removal, de- skewing, blank page removal and has ultrasonic detection when more than one page at a time is fed to the LED scanning array. Preparing publications for sheet feeding. The spine or binding must be removed using an industrial paper cutter. Note: when items are on loan, this procedure is not used. See the Atiz Bookscan below for the process used in such cases. Documents which can not be stripped at the binding for single page scanning can be scanned with no damage, wear or stress using the Atiz BookScan device which holds the publication on a platen open at about a 120° angle under balanced LED lighting and takes digital photos using a pair of Canon EOS 80D cameras. Pages must be turned by hand, so it might take 3 hours to do a 1000 page book. Click the image to see the Atiz BookScan Mark 2 Lite PDF Brochure..
At each step, specialized software applications are used to enhance the scans. 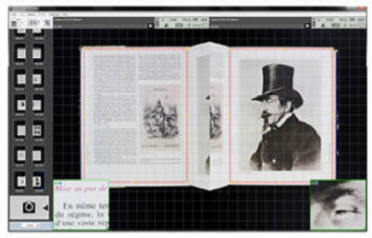 Here is a veiw of BookScan Capture, which uses the Bookscan device to photograph "pairs" of pages from books and magazines. Focus, shutter speed and aperture can be set for the best capture. We use two Canon T3i cameras in our BookScan device. Big projects of very large or very delicate documents are scanned on a DS 5000 12" x 19" flatbed scanner from Epson. While this is the slowest method by far, with a 100 page document taking upwards of a half-hour, it is the best way to capture brittle old publications or oversized documents. Click picture for Epson website specifications and pricing. The consumer version is only $39.95 and is much better than anything that comesbundled with lower-cost scanners. Whether a page is scanned on the sheet fed Kodak, the BookScan Mini or one of several flatbed scanners, the JPG originals are processed in BookDriveEditor. Here things like contrast, brightness and color gamut can be adjusted. Background removal is possible, as is de-skewing, resizing and sharpening. It's possible to take poor and discolored originals and make them very legible and useful with this application. Once documents have been optimized in BookDrive Editor, they are processed in Foxit PDFCompressor Professional (Formerly CVision PDF Compressor) , where huge jpg files are converted to manageable PDFs for Internet viewing. At the same time, the documents are processed for Optical Character Recognition so that they can be searched. Click the graphic to see the PDF Compressor home page. Publications that are part of large collections, like Broadcasting Magazine, are globally indexed so that the entire collection can be searched. We use Zoom Search Engine from Australia's PassMark. It creates highly configurable search databases that are callable via css functions. Click the graphic and you can visit the Zoom Search website. One of the features of Zoom Search engine is the ability to add a thumbnail for each "find" in a search. This helps determine if the search result is what the user is looking for. We use several programs to split all the PDFs into single-page files and then to create a small thumbnail image of each... currently 4.5 million of them. This site is a contribution to the radio industry by its webmaster. It serves a practical purpose of demonstrating my commitment to my profession and my consulting clients naturally appreciate that. A side benefit is in being able to give something back after 60 years in a sometimes frightening but always exciting field of endeavor. We welcome site user contributions. If you wish to simply give items, email us! If you wish to loan documents which are to be returned, we can provide shipping via UPS or USPS both ways. If you have scanned documents yourself or want to do so, contact us for our preferred file formatting information and access to our DropBox account.